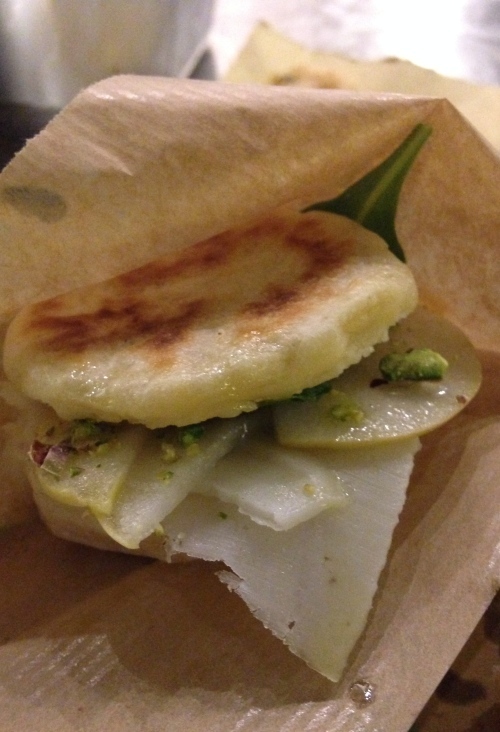 Pianostrada Laboratoriodicucina in Trastevere: a guest post by Katie Parla. Trastevere was once a haven of cheap, delectable, no-frills dining, but in recent years, the district has become a bastion of tourist traps in which cheesy checked tablecloths and aggressive touts are far more numerous than great meals. This district, which lies on the Tiber River’s left bank, opposite the Centro Storico, is undeniably attractive, in spite of its grim dining offerings. Its warren of medieval streets are punctuated with Renaissance churches and appealing piazzas. The whole place is so painfully beautiful no one in Trastevere needs to serve edible food to draw visitors. So most don’t! This is what makes the arrival of Pianostrada Laboratoriodicucina, a casual cafe in the heart of Trastevere, so supremely unusual and desperately necessary. When it opened in late May, locals rejoiced at the fresh food and kind service that immediately set Pianostrada apart from its tourist trap neighbours. The place is the work of four partners: Chiara Magliocchetti, Paola Colucci, and her daughters Flaminia and Alice. These women saw an opportunity to provide quick and delicious meals and dedicated themselves to serving quality food made with excellent ingredients, all rare features in the surrounding city blocks. The menu consists of salads, sandwiches (both open faced and closed), pasta, snacks and sweets. The food is prepared in an open kitchen and can be eaten at the long, bar-like seating area trimming the kitchen, or at one of the high wooden tables on the opposing wall. The ingredients are sourced mainly from Lazio, the region of which Rome is the capital, right down to the organic flour used to bake the various types of bread baked in house – olive oil, cured meats, cheeses and craft beers are selected by Vincenzo Mancino of Di Origine Laziale, a restaurant and deli in Rome’s eastern periphery. Mancino is a champion of small, local producers and is trusted by the city’s top dining venues to curate their cheese and salami selections. 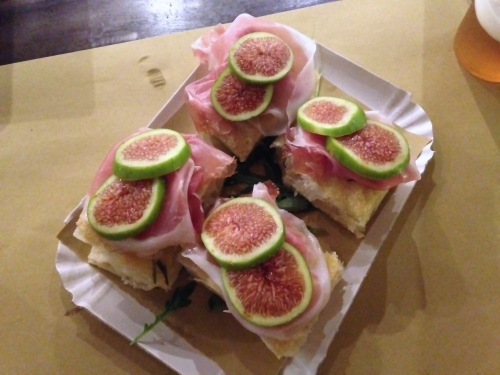 Pianostrada serves these local delicacies on their various sandwiches, as well as assorted meat and cheese plates. Other ingredients are culled from producers from beyond Lazio’s borders, like the mozzarella and buffalo mozzarella, both sourced from southern Italy. Cod, a typical Roman ingredient, is imported from northern Europe. Cod features in Pianostrada’s signature Baccaburger, a sort of fish patty on squid ink bread dressed with house made mayo, confit tomatoes, arugula and zucchini flowers. The menu at Pianostrada changes to reflect the availability of raw materials, like a later summer prosciutto and fig focaccia or pear and pecorino pairing. The portions are on the larger side, but be sure to save room for dessert, all made in-house. Alice runs the pastry department and bakes assorted cookies, brioche, krapfen and cakes. She also whips up fresh items like ricotta mousse with seasonal fruit and tiramisu with figs and pine nuts. There is a small selection of wines and craft beers to pair with Pianostrada’s made-to-order fare.